We teach the skills to fight. The kicks and punches we teach can cause real damage. That's not what we want. Kids fight because they are scared. Scared of not being seen as "cool" or "tough." What we want is for kids to have the confidence to walk away. The best fight is the one they are able to avoid. But, if they must defend themselves, do only what is necessary to control the situation - as quickly as possible. Isn't that what we want for our kids? As soon as punches are flown, chances are, someone is getting hurt. So what techniques can we teach that help students to fulfill their oath if they are being bullied, or if their friends are in that situation? 1) Help the friend to avoid the situation. Let them know that they are welcome with you ANY TIME. Invite them to sit at your table at lunch. Walk them to class. Just be there. 2) Stand by them. If you see a friend getting a hard time from a bully, your friend is hurting in that moment. You DON'T need to talk to the bully. Talk to your friend. Go to them and say, "Hi, want to come play with us?" 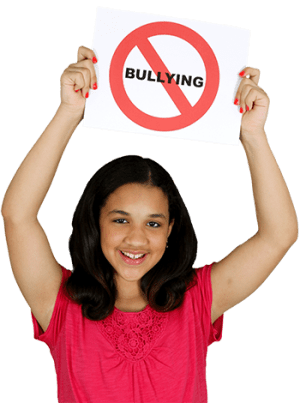 Get them out of that bad situation WITHOUT getting involved with the bully directly. 3) Strength in Numbers. Again, you don't need to confront the bully alone. Get a few kids to stand behind you and go talk to your friend. (Don't address the bully at all). In this way, you let them know without saying anything that he or she is the outcast, and not the top dog that they THINK they are or are pretending to be. 4) Get a teacher. Just go get help. Your friend needs you. This is not tattling. Tattling is when the goal is to get someone in trouble. Telling a grown-up that someone is in trouble is the sign of someone who cares. Now, what if your child is the good kid who seems to get picked on by the same kid over and over. It's time to make that stop. 1) Use your words. We teach people how to treat us. Tell them loud and proud, "Stop! I don't like that." Or, "Leave me alone!" 2) Use your brain. Easier said than done. But try not to put yourself in bad situations. Don't let your mouth get you in trouble. Think before you speak. 3) Walk away. You may need to run away. Depends on the situation. If you are 10 years old and a 7th grade kid who is 5'8" 180 pounds wants to fight you, better to get out of there if you don't know how to handle that situation. You have nothing to prove. 4) Get help. PLEASE, PLEASE, PLEASE. If you are being bullied on a regular basis, tell your parents. Tell a teacher. They will help. 5) Defend yourself. You've run out of options and this kid wants to fight you. Okay. First, hands up and open. Don't make fists. Assume a defensive position so that everyone knows you don't want to fight. Have a tiger's eye and a lion's roar. Look them in the eye and let them know clearly you don't want to fight, but you will defend yourself if they don't walk away. You must protect yourself. Move. Use your feet and protect your face. Call for help. If you are trained, end it quickly with an arm bar or some take-down that allows you to control the person so they cannot hit you. If help is not there, make the person promise while under your control that they are done fighting, or you will put them down again. Do your best to avoid a fist fight. The longer it goes, the more likely it is that you will get hurt. We teach the techniques described here in our kids' martial arts classes. But more than that, we teach the 5 tenets that build competence and confidence, so that kids can avoid these situations: Courtesy, Integrity, Perseverance, Self-Control, and Indomitable Spirit. And this is why martial arts kids are like Kryptonite to bullies. They are not the easy targets. Bullies want to take advantage of a perceived power advantage. Martial arts kids have the skills and the confidence that bullies avoid.